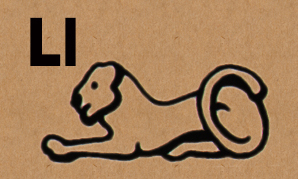 Today's hieroglyphic is the letter "L"
It's pronounced "L" as in LION." The L symbol is easy to remember. It is represented by a lion. The word lion starts with L.
Think of a LION to remember its shape.